Discovered this 80s style promotional video for the new X-Men movie Apocalypse hosted by fan favorite mutant Jubilee! It is done so well in the style of 1980s infomercials that I could believe it came off someone's old VHS tape of shows they recorded off air! 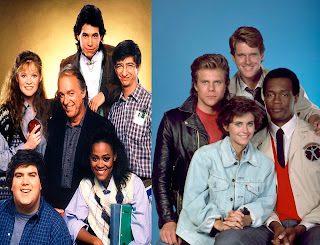 This commercial would fit perfectly between episodes of Head of the Class and Misfits of Science. At the end a number for the school appears on screen. 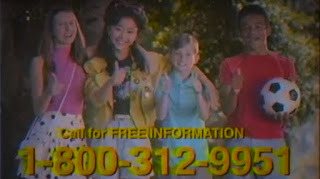 If you call the number, you get a recorded message from Stan "The Man" Lee pimping the new movie in theaters. EXCELSIOR! I was a big fan of X-Men: Days of Future Past and I can't wait to see Apocalypse...hopefully soon? and the silver tuna of the group, Scottie Pippen 1993-94 Topps Stadium Club "Frequent Flyers" card! 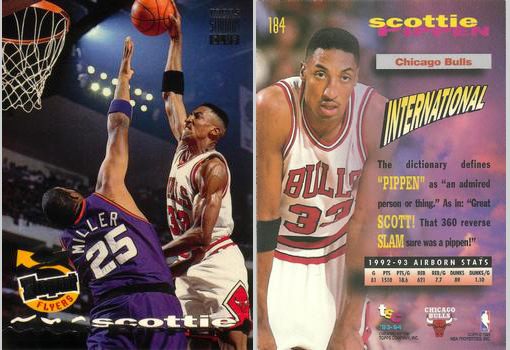 Then there were 25 other common cards that featured players like Bip Roberts that I really didn't care about. Overall, I feel like I got my dollar's worth out of the pack and if I found another "Ultimate Super Jumbo Pack" with a card I wanted to own in it, I would spend the dollar. 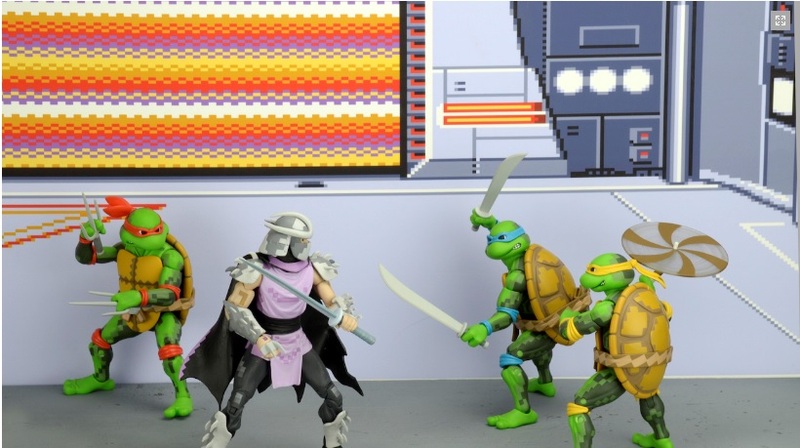 I may be a little late to the game on this one, but NECA will be releasing 2 Teenage Mutant Ninja Turtles boxed sets based on the classic 1989 Konami arcade game! I must have these! Unfortunately, they will only be released as exclusives at this year's San Diego Comic Con. 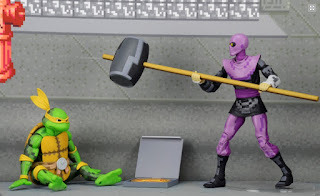 So this means that I, or the average Turtle fan will have to pay a premium to scalpers on ebay if we want the chance to own these beautiful figures. "Cowabunga, dude! 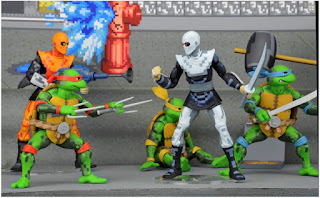 This SDCC-exclusive box set is based on the classic Teenage Mutant Ninja Turtles 4-player co-op arcade game and features brand new figure sculpts and deluxe packaging. Leonardo, Donatello, Michelangelo and Raphael stand approximately 6” tall and feature over 30 points of articulation, including double knee joints to fully showcase their mastery of the martial arts. Special paint deco reflects the Turtles’ in-game appearance. 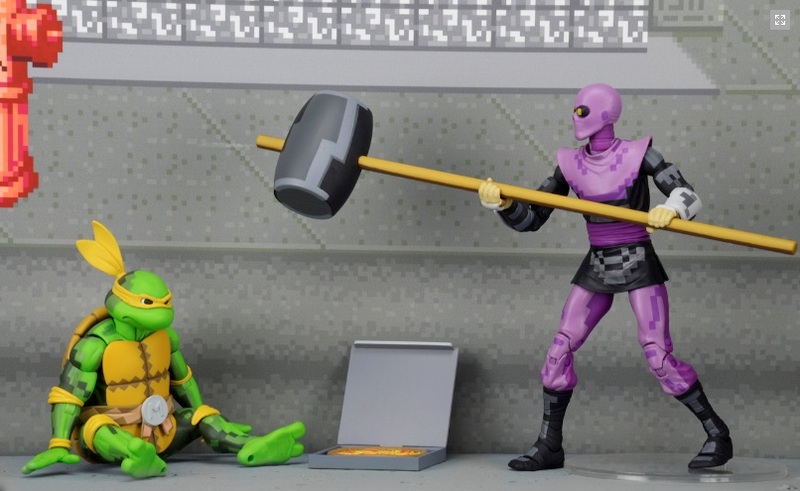 The box set is packed with accessories, including signature weapons, interchangeable hands, pizza power-up and more. The set comes in gorgeous, display-friendly 5th panel window box packaging that re-creates the look of the actual arcade cabinet!" 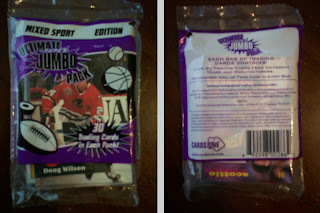 Seeing these made the memories flood back. Not to brag but, me and my brother beat the entire game at a Chuck E. Cheese restaurant. 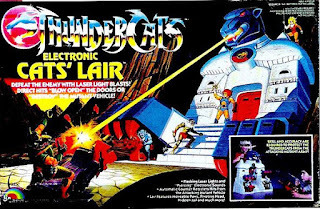 The whole time we were freaking the Foot and mangling Mousers on our way to save April, kids were watching and waiting to see what would happen on the next cut scene. It was so satisfying to see the Technodrome totaled at the end. We felt like super stars that evening. I don't believe that these toys will ever make it to retail shelves, but I will hold out hope. For more info, pics and a video visit the NECA website by clicking HERE. Found these vintage sealed gems at a local thrift store yesterday. Couldn't pass them up for only $0.49! 8 Teenage Mutant Ninja Turtle Loot Bags manufactured by unique in 1989. 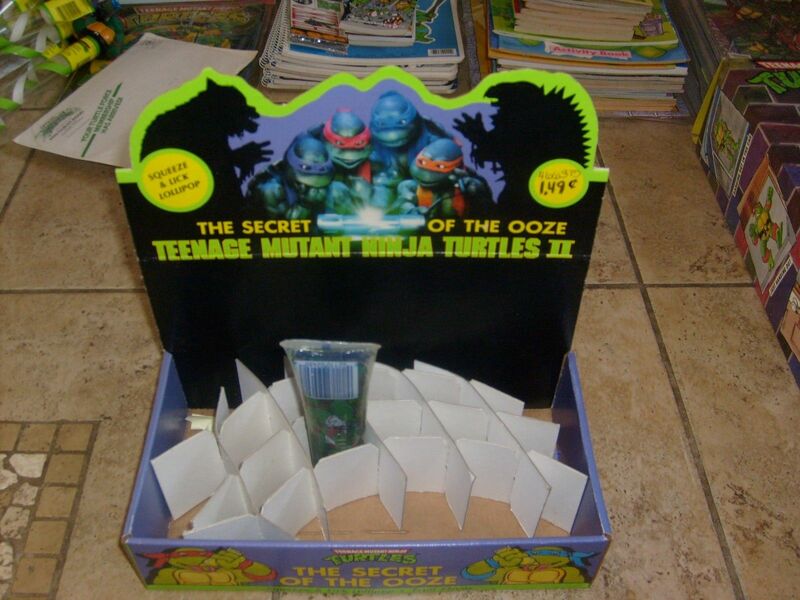 I know we all have seen this classic Turtles artwork before on everything from Valentine's cards to stickers, but anything that I can find in it's original package featuring the Green Teens is worth a pickup. I will continue to post my finds as they come in over the Summer. Now I just need to throw a party? the Teenage Mutant Ninja Turtles Squeeze Lollipop! 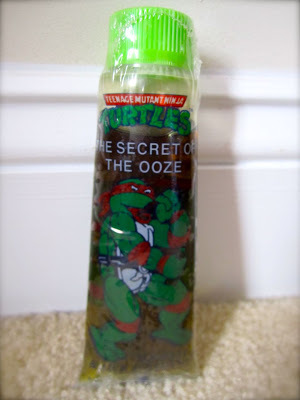 These came out around the same time as the movie The Secret of the Ooze (1991) and they were amazing! I remember buying these at the local KB Toys and treating them like it was the last thing I had to eat. Little by little I would squeeze just enough Ooze out to get my sugar fix, but leave enough so I could enjoy it for weeks. The only problem was that if you didn't eat it fast enough and left the cap on for a few days, the Ooze under the cap would get crusty and almost glue the top on. The taste was amazing and only referred to as "Fruit" on the packaging. Since it was green, gooey and gross, it was the perfect candy for a 10 year old boy. The only place I could find any info/pics of this product was on the great site The Sewer Den. 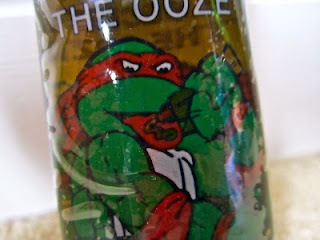 I can't believe with all the retro blogs out there, not more people are reminiscing about this unusual but tasty Ninja Turtle licensed candy? I have been trying to track down a tube of this stuff, but they are hard to find. If you're lucky, one will pop up on ebay. The only problem is they cost about 100 times their value. The last one I saw was listed at the bargain basement price of $59.99! You can view the listing HERE. It was the Christmas of 1986 and Ghostbusters was one of the hottest things any kid could own that year! Me and my brother went to bed the night before with visions of proton packs and marshmallows dancing in our heads. When we woke the next morning, the living room was covered with wrapped gifts of joy, but as we started unwrapping I felt something was a little off. 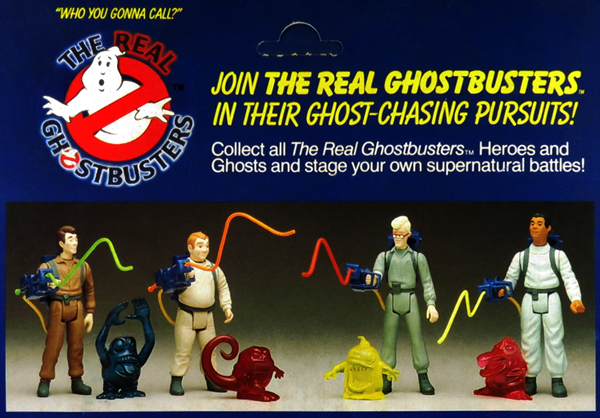 My brother unwrapped the original Kenner action figure of Peter, then Ray, then Winston, then Egon, then Stay Puft. 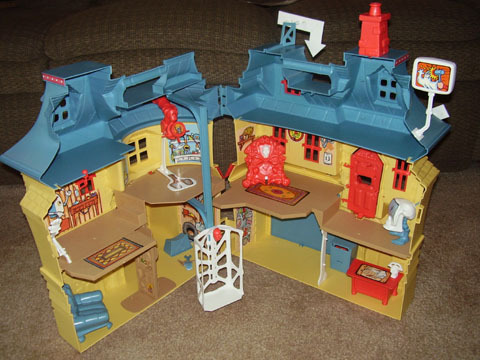 He even scored the Filmation Ghostbuster's House and car! But, where were my Ghostbusters? There must be some mistake? What did I do to deserve this injustice at the age of 6? Was I that bad? I did finally unwrap Slimer, which is a great toy by itself. 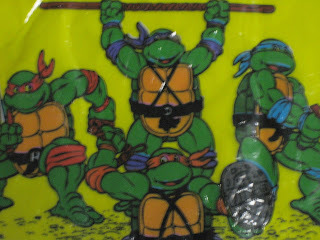 I can still remember the smell of the rubber pizza as it was taken out of the package. And I don't know if this happened to anyone else, but over the years half the pepperoni pizza paint wore off. I just imagined that Slimer was sharing his pie with Peter, who stubbornly would only eat cheese pizza. Slimer was that special kind of thoughtful ghost. My parents eventually explained to me that I did have a gift that must not have made it into Santa's bag. They told me I should watch for a brown truck to show up at our house any day now. I watched out that window like a hawk for about two weeks, the damn truck never came! Eventually my parents made good on their promise and I did receive an amazing gift...the legendary LJN Thundercats Lair!!!! I played the hell out of that toy!!! I guess it was worth the wait, but I will never forget that Christmas of 1986. I still bring it up to this day to my Mom & Dad. Thanks for reading and I hope you enjoyed my first post on 20 Years Before 2000!